The MacBook Pro's graphics chipset used a portion of main memory as VRAM. Though reported as a 256 MB graphics system, the chipset actually used up to 272 MB of RAM. A single 3.5mm jack could be used for analog or optical audio out, or analog audio in. Introduced in April 2010, the MacBook Pro (13-inch, Mid 2010) replaced the MacBook Pro (13-inch, Mid 2009). Improvements included faster Core 2 Duo Processors, a faster graphics chipset, larger hard drives, and more RAM on the base model. The MacBook Pro (13-inch, Mid 2010) shipped in two configurations: 2.4 GHz/4 GB RAM/250 GB HD/$1199, 2.66 GHz/4 GB RAM/320 GB HD/$1499. Built-to-order options included a 500 GB hard drive, a 128/256/512 GB solid-state drive, and up to 8 GB of RAM. 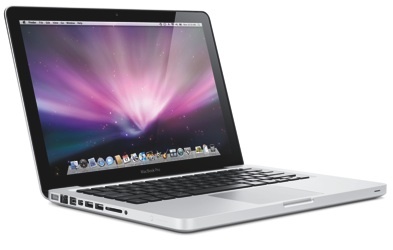 The MacBook Pro (13-inch, Mid 2010) was replaced in Febrary 2011 by the MacBook Pro (13-inch, Early 2011).